August 12 is so called in the UK as it is the start of the grouse shooting season, however in our case, it is our wedding anniversary. Yes, we made it through 12 months of matrimony travelling in small living quarters without killing each other. You may be surprised to learn that we found a fabulous restaurant in Concarneau where we were camped in the south of Brittany. It was in the modern funky French style with food in the same theme. Really was another wonderful lunch. As the forecast was for rain, we left Brittany the next day. We just can’t do with any more rain. 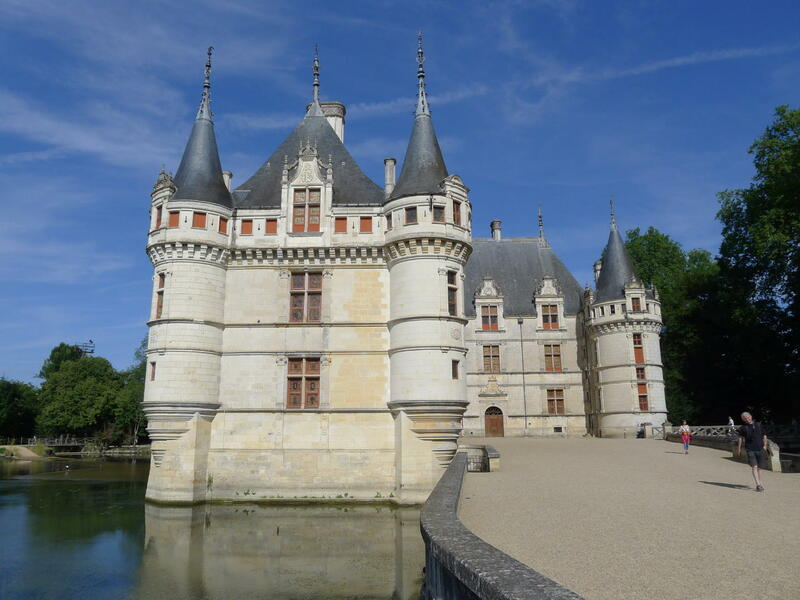 We arrived in the Loire Valley to lovely sunshine and camped in Montsoreau by the river near Saumur. 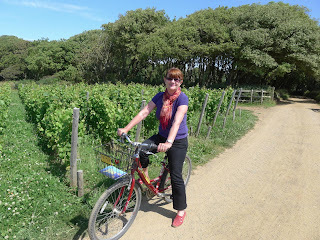 We absolutely loved the Loire Valley, so much to see and do, and so much wine to taste. We were highly impressed with the quality of the wine being produced here, mainly Cabernet Franc and Chenin Blanc of course, but enough Chardonnay and Pinot to make some decent sparklings. The Loire Valley wine region is mainly planted on chalky limestone and many of the wines ‘caves’ are simply dug into the chalk cliffs. There are still many houses being lived in that have been built this way. It’s quite odd to see lace curtains hanging in a cliff face. What do you think of our new pad?? We visited some wonderful Chateaux, an amazing abbey where Eleanor of Aquitaine ended her days. 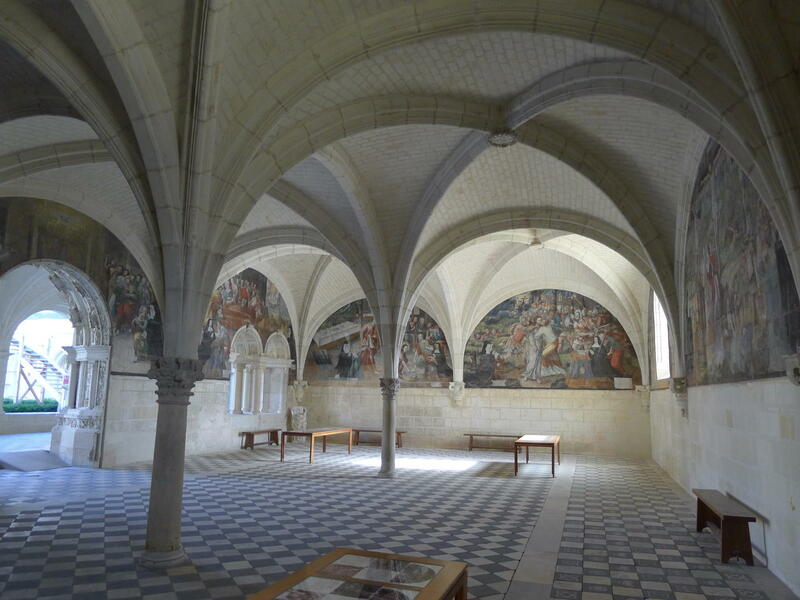 She was quite a gal in her day, much loved and very devout, but finished up as a Nun in Fontevraud Abbey and is buried there along with her hubbie (Henry II) and 2 of her 8 children. The small town of Chinon was a complete surprise. Not only is the wine wonderful, but the town is a real delight. Just as you imagine, cobbled streets, quaint stone buildings, a fortress, a river, and wonderful restaurants. After leaving the Loire, we headed straight to Monfort in the Gers, where our friends David and Alison have that wonderful house ‘Au Petit Lombard’ where we stayed last year. 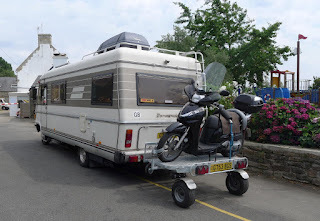 As Alison was heading back to the UK we made a 500km dash in the Hymer to get there before she left. The ‘dash’ took 8 hours in 40 degree heat with no air-conditioning. We wanted warm weather, and oh boy, do we have it. 42° the day we arrived and high 30’s each day at the moment. The swimming pool is getting a lot of use. We’ll backtrack after this to the Dordogne and then head to Bordeaux before going south and over the Pyrenees. If anyone reading this is ever tempted to use Orange Telecom Prepaid internet, here is my advice. Take 4 x 50 euro notes and walk into an Orange shop. Put 2 x 50 euros notes on the counter and set fire to them. You’ll get the same outcome as if you actually tried to purchase internet connection, but you’ll have the satisfaction of them having to clean up the mess. 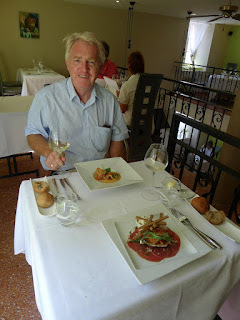 Then take the other 2 x 50 euro notes and go and have a damned good lunch. You’ll feel a whole lot better and won’t care if you can’t upload your blog or Skype your friends. At least you will have received something in exchange for your 200 euros. We are now on SFR prepaid internet which works, is cheaper, but coverage is very patchy. So don’t blame me if blog entries are spasmodic. We’ll either be out to lunch or in a non-coverage area. We’ve been camped near St Malo in Brittany for a week in a campground filled with the French on holiday. 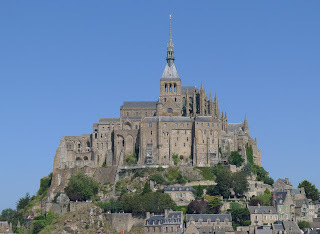 We vowed that we would never come to France in August because they all take their holiday at that time and we prefer to avoid tourist crowds if possible. However, as you know, we were desperate to get back to Europe and find some sun, so we gritted our teeth and crossed the channel. This campsite is typical (I believe) of this time of year. There are large family groups everywhere, the pool is so full you can’t get in it, the children’s karaoke is hideous, the roads are busy, towns are crowded, but despite this – it’s all OK. Our spot is fairly quiet and the sun is shining!! We left the van here whilst we went to Jersey for a few days to stay with Sam’s Mum, who showed us some wonderful island hospitality. It was pretty busy but easy to get away from the crowds and find beautiful scenery with lovely beaches, and a decent lunch. We wandered through the tunnels built by the Krauts during the occupation of the Channel Islands. It was so interesting to see what the locals went through under occupation. It was a very personal museum and seemed to really give a sense of how life was for them. Of course Lawrence and I had to seek out the local winery and taste some wine. 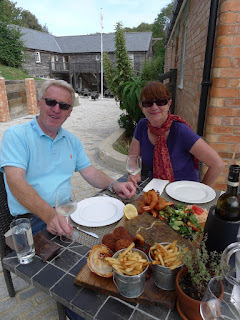 We declined the tour, but sat in the sun and sipped on a couple of glasses, whilst we rubbished the vineyard canopy management, the choice of grape varieties (mostly nasty hybrids) and their wine-making – so a very enjoyable half hour! 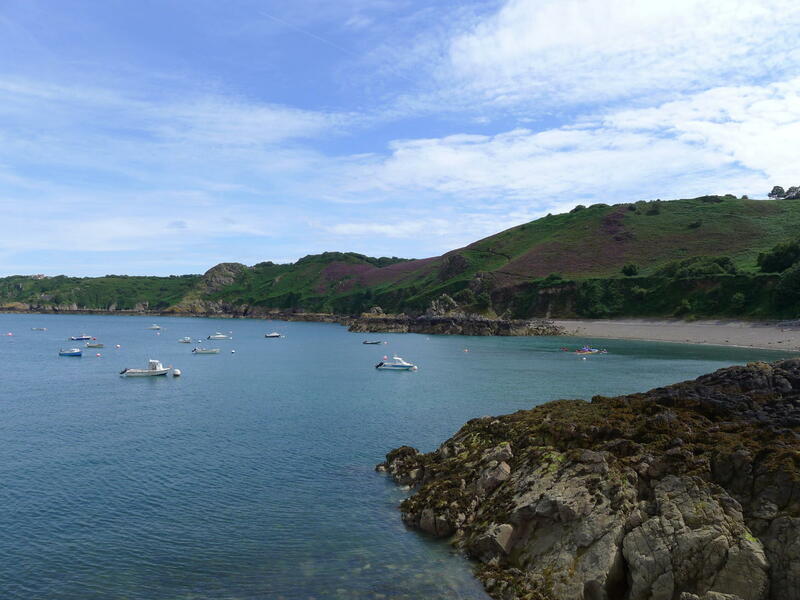 We ferried across to the island of Sark for a day. The island has no cars, so you either walk or ride a bike. You can also take a horse drawn carriage and the local bus is a tractor! We hired bikes for the day, even though I was a bit nervous I soon got into the swing of it, inspired by the promise of a good lunch and a bottle of vino. So yes, we are back to having lunch in the sun – finally! 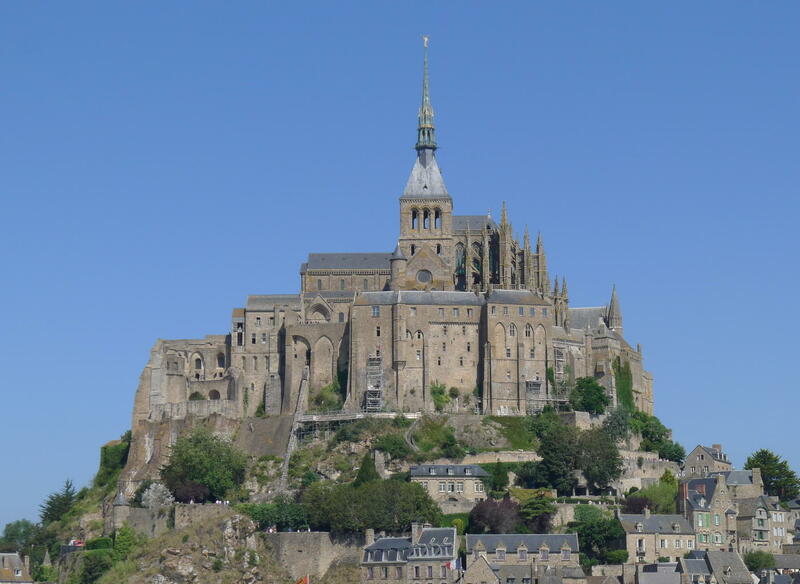 Back in France, we revved up the scooter and zipped over to Le Mont St Michel. It seemed a crime to be in the area and not see it. Now, we both knew it would be crowed, but blimey!! It was literally heaving with holidaymakers, thousands of them. 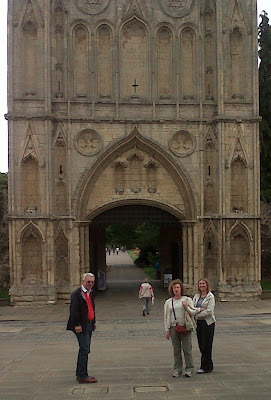 We elbowed our way around the village at the base of the abbey, took the obligatory photos then sought out some Moules Frites for lunch. It is a stunning sight, but really no more spectacular than many places we have seen. It is simply its island location that makes it so special. 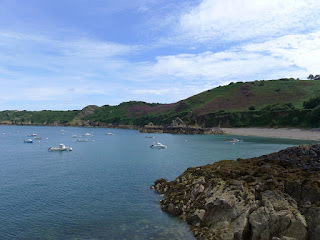 Tomorrow we head for South Brittany for a few days and then onto the Loire. Once again internet is dire, so this post is late. 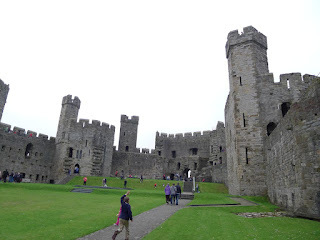 Our first stop was Porthmadog, still in Wales (we loved the weather so much), so we could do our last steam train trip to Caernarvon on the Welsh Highland Railway. Of course we wandered around the Norman castle and found a lovely pub for lunch. We had thought that we would spend some time in Ireland visiting friends, but honestly we just couldn’t stand anymore of this terrible summer. I need some sun and warm weather, we need some summer before it’s over. I think I’m suffering from S.A.D. Next stop was Shrewsbury, chosen for the fact that it was on the way to where we needed to be to have some more work done the new (old!) motorhome. What a surprise find this town was, really lovely with loads of Tudor architecture. This is where I did my first bike ride since the accident. I was really nervous and made Lawrence ride my bike first to make sure it was going to behave. I made it to the shops and back without mishap. It’s amazing what you’ll do to buy wine. Whilst the van was having some bits done – including a smart new trailer for Mojo, we spent 3 days in Oxford with Hilary and Alun and then back to Spratton in Northamptonshire with Stephanie and Mark. Our introduction to Oxford was a Chilean wine tasting in the Great Hall at Oriel College – simply wonderful! Oxford is a real architectural feast for the eyes – everywhere you look is another stunning college, church, tower, pub… We also popped over to lovely Bury St Edmund’s for a day to catch up with Lawrence’s sister Helen who was staying with a friend there. We left UK shores on August 3, ferried to Calais and drove south. Spent one night in Normandy and made it to Brittany the next day. We are now in the beautiful (post-war rebuilt) walled city of St Malo. I finally feel like we are back in Europe and have restarted what was rudely interrupted than 4 months ago. The ankle is OK but still swollen, stiff and numb. I can walk for more than an hour but am a bit slow and need to rest often. Frankly I’m sick to death of it! We new home is slowly coming together. There is not as much storage space as the Mog, which was very well designed to maximise space. We accumulated too much stuff as I kept finding places to put things. Lawrence even found a hidey hole under the wardrobe that we didn’t know about!!! Could have bought more sherry. The new bus is packed to the gunnels and we sent quite a few things to the charity stores in Conwy. No more shopping!!! Off to Jersey tomorrow to stay with our friend Sam’s Mum.